There are no lesbians. Only women who have not met Rajnikant! Rajnikant wanted someone who wouldn't bow in fron't of him, so created GOD. Once Rajnikant kicked a horse in the chin.. It's decendents were found to be giraffes!! If u mistype Rajnikant 's name in Google, it doesn't suggest a correction, It simply says "Run While You Still Can!!!!" Once superman made a bet with Rajnikant, the loser had to wear the underwear outside ! Rajnikant died 20 years ago. Death hasn't built the courage to tell him yet! 1. Rajnikant killed the Dead Sea. 2. When Rajnikant does push-ups, he isn't lifting himself up. He is pushing the earth down. 3. There is no such thing as evolution, it's just a list of creatures that Rajnikant allowed to live. 4. Rajnikant gave Mona Lisa that smile. 5 .Rajnikant can divide by zero. 6. Rajnikant can judge a book by it's cover. 7. Rajnikant can drown a fish. 8. Rajnikant can delete the Recycle Bin. 9. Rajnikant once got into a fight with a VCR player. Now it plays DVDs. 10. Rajnikant can slam a revolving door. Here is an interesting new story...! Rajinikanth was bragging to Jayalalitha one day, "You know, I know everyone there is to know. Just name someone, anyone, and I know them." Tired of his boasting, Jayalalitha called his bluff, "OK, Rajini how about Tom Cruise?" "Sure, yes, Tom and I are old friends, and I can prove it" Rajini said. So Rajini and Jayalalitha fly out to Hollywood and knock on Tom Cruise's door, and sure enough, Tom Cruise shouts "Thalaiva! Great to see you! You and your friend come right in and join me for lunch!". Although impressed, Jayalalitha is still skeptical. After they leave Cruise's house, she tells Rajini that she thinks Rajini knowing Cruise was just lucky. "No, no, just name anyone else" Rajini says. "President Bush", Jayalalitha quickly retorts. "Yes", Rajini says, "I know him, let's fly out to Washington". And off they go. At the White House, Bush spots Rajini on the tour and motions him, saying, "Rajini, what a surprise, I was just on my way to a meeting, but you and your friend come on in and let's have a cup of coffee first and catch up". Well, Jayalalitha is very shaken by now, but still not totally convinced. After they leave the White House grounds, she expresses his doubts to Rajini who again implores her to name anyone else. "The Pope", Jayalalitha replies. "Sure!" says Rajini, "My folks are from Poland and I've known the Pope a long time". So off they fly to Rome. Rajini and Jayalalitha are assembled with the masses in Vatican Square when Rajini says, "This will never work. I can't catch the Pope's eye among all these people. Tell you what, I know all the guards so let me just go upstairs and I'll come out on the balcony with the Pope." And he disappears into the crowd headed toward the Vatican. Sure enough, half an hour later Rajini emerges with the Pope on the balcony. But by the time Rajini returns, he finds that Jayalalitha had a Heart Attack and is surrounded by paramedics. Working his way to Jayalalitha's side, Rajini asks her, "What happened?" Jayalalitha looks up and says, "I was doing fine until you and the Pope came out on the balcony and the man next to me said who's that on the balcony with Rajini?" Newton - The Father of Physics committed suicide, you know why? Once he came to India and He watched a few Tamil movies and had his head spinning He was convinced that all his logics and laws in physics were just a huge pile of junk and apologized for everything he had done. In the movie of Rajanikanth, Newton was confused to such an extent that he went paranoid. 1) Rajanikanth has a Brain Tumor which, according to the doctors can't be cured and his death is imminent. In one of the fights, our great Rajanikanth is shot in the head. To everybody's surprise, the bullet passes through his ears taking away the tumor along with it and he is cured. Long Live Rajanikanth! 2) In one of the movies, Rajanikanth is confronted with 3 gangsters. Rajanikanth has a gun but unfortunately only one bullet. Guess, what he does....... He holds a knife in his hand and throws at the middle gangster & shoots the bullet towards the knife. The knife cuts the bullet into 2 pieces and kills both the gangsters on each side of the middle gangster & the knife kills the middle one. This was too much for our Newton to take and he was completely shaken and he decided to go back. But he happened to see a movie for one last time! and thought that at least one movie will follow his theory of physics. The whole movie goes fine and Newton is happy that all in the world hasn't changed. The Climax finally arrives. Rajanikanth gets to know that the villain is on the other side of a very high wall. So high that Rajanikanth can't jump even if he tries like one of those superman techniques that our heroes normally use. 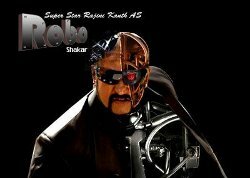 Rajanikanth has to desperately kill the villain because its the climax. (Newton dada is smiling since it is virtually impossible). Rajanikanth suddenly pulls two guns from his pocket (Probably a backup). He throws one gun in the air and when the gun has reached the height of the wall, he shoots at the trigger of the first gun in air, with his second gun. Now the first gun fires off and the villain is dead.